Skin-tight seal against hair and water for children. 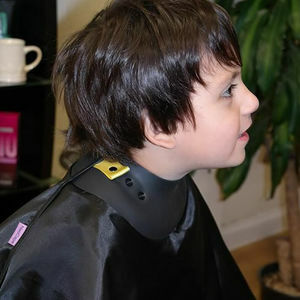 The Neocape Unigown Child is the children's version of Neocape's unisex hairdressing cape that creates the ultimate seal against hair and water. It features the special Neocape neoprene seal that's designed to fit snugly to a child's neck to minimise hair and water penetration. The Unigown is made from a durable, lightweight and water-resistant fabric that's extremely comfortable for children to wear to a unisex design that means it will work equally well for boys or girls. £22.19 (inc. VAT) Why no VAT? We're a trade wholesaler and quote our prices without VAT to help our VAT-registered customers understand the true cost of a purchase.